Happy Bloggers Challenge Friday! With it being Memorial Day weekend, this weeks challenge is Patriotic. What better weekend to honor those who have served our country! 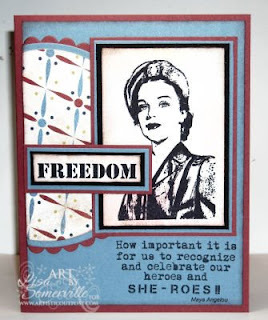 They fought the fight to "Let Freedom Ring"
I just LOVE these images from the Artistic Outpost She-roes plate that honor the women who serve in the Military. The image is stamped in Black on Watercolor paper, to add a bit of color, I used the Watercolor Distress Technique, on both the focal image and the sentiment. Don't forget you can save 10% on all purchase as Artistic Outpost, just use code LS-10off when you check out - this code doesn't expire, so feel free to pass it along to your friends! Thanks for stopping by, I hope you have an enjoyable Holiday Weekend! Don't forget to check out what the other Bloggers Challenge members created this week. Just click the logo on my sidebar. Isn't she beautiful!! Awesome job with the challenge. Your work is beautiful (as always) have a great weekend. Thanks for remembering the women who fight for freedom! Great card! I really like the layout. Great card, Lisa! I really like these "she-roes" images! Gorgeous, I love the tad of black with the colors it looks fantastic! Great, great job, Lisa. Love the image and the sentiment! This is fantastic, hey you should join the cards for heroes blog hop this weekend. You know I had to go purchase this stamp set cuz I thought they were so awesome! Simply Fabulous. What a fantastic image (Love it) and you did a great job showcasing it. Wonderful card! Love that the women get some Memorial Day love! Stunning card, Lisa!!! Love your new avatar picture. What a wonderful way to remember the women who have served our country! One of my fav sets right now. Love it! I love this too! I only just found out about their stamps, I think I feel a shopping spree coming on...LOL. First of all....great haircut...what a hottie you are!!!! LOVE this card!!! That DSP is super cute with this image! I really like the layout combo of the rectangle and the scalloped circle!!! What a beautiful card--just perfect for the occasion. This card is wow. So perfect for this weeks challenge! Wonderful cards. I have the Heros set from Artistic Oupost and love it. You keep on inspiring me. Thank you for sharing and designing all your wonderful cards. Super card! Love to see your collection of stamps. This one really takes the cake. Awesome stamp! Love your card...great job with this challenge! What a great stamp set! It is about time there is a female soldier stamp set. Great layout too. She-roes - what a great idea! Lisa, love the She-roes image and sentiment, the layout and technique! Great card!